Too many times in 2014 I felt like I was on the verge of losing my mind. Too many times in 2014 I felt like I didn’t have an ounce of strength left to give. This year, I am over it! I refuse to let the devil have my mind and I know that God’s strength is made perfect in my weakness. And there are a ton of times that I’m reminded of just how weak I am. This year, I choose to rejoice in those weaknesses so that His strength can shine! I’m gonna trust that God is more than enough and try to maintain a closer relationship with the Lord. I couldn’t make it without prayer and God’s Word. If I’ve said it once, I’ve said it a million times— prayer and the Word are the only things that allow me to keep my sanity and allow me to stay saved and sanctified! I really needed my One Verse 2014 (Philippians 4:11) about being content and I am still clinging to that verse. That’s another reason I love and chose this year’s One Verse. How can I be content? How do I overcome envy or longing or anything? By knowing that GOD is sufficient! He is enough for me. 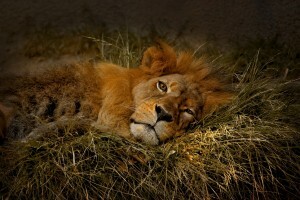 He is all I need. Besides, in Matthew 6:33, it says we are to seek first the Kingdom of God and all these things will be added. Anything else is an added bonus because without Him, it’s worthless. He is sufficient. My Pawpaw Bill always said, “If you’ve missed heaven, you’ve missed it all.” I refuse to miss heaven for this world. When I cling to Him and only Him, the troubles of this world fade away and I know I can make it. He’ll see me through. Why? 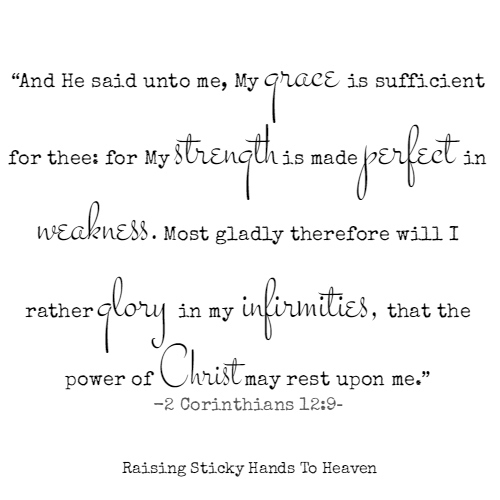 Because His grace is sufficient for me! My One Word 2014 was “Fruit”. What I love about having a One Word for the year is that it doesn’t go away when that year is over. Once you’ve spent a year focusing on that word and why you picked it, it’s bound to stay with you. It just allows you to soak that word into your spirit in a deeper way so that it sticks with you for the rest of your life, causing you to grow. That’s what is intended, right? You may not think on it every day, but it shows up when you need it. Makes me wish I had started having One Words sooner in life. Having “Fruit” was a reminder for me to pay attention to what I’m putting out there (on a daily basis and in my overall life). Am I producing Godly and beneficial fruit? Or is the fruit I’m producing so rotten it stinks? That One Word had me focusing on my fruit and despite my New Year and new word, it’s a reminder that I’ll always need and appreciate. Sort of like my own accountability partner. I don’t even come close to perfectly exhibiting any of these, and I am striving to do better with them all. 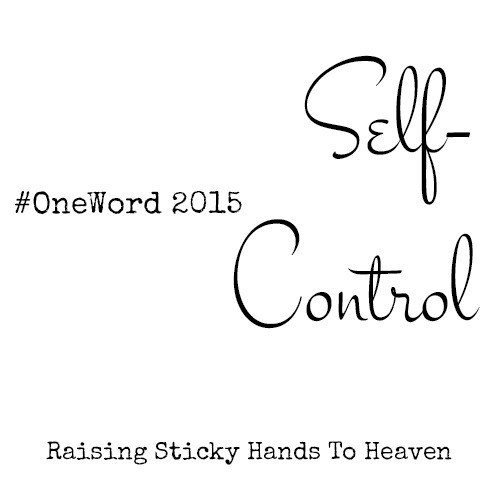 However, I have a particularly rough time with SELF-CONTROL, my One Word 2015. I believe this is listed as a fruit of the Spirit because it is somewhat of an ugly word to our flesh. It’s like John said, “He must increase, but I must decrease.” (3:30 KJV) To deny/crucify my flesh so that the spirit is in control…that’s the only way self-control works…when there is MORE of Him and LESS of me. As long as I’m in the way, nothing will work out right. It is high time for me to take spiritual authority and force my flesh to submit. Will it be easy? Probably not. But if I want to produce Godly fruit, if I want His will over mine, then I have got to be obedient to the Father, NOT the flesh. For me, the perfect example of self-control was shown in Jesus as He hung on the cross and said, “It is finished,” instead of calling for ten thousand angels. Will I ever have it that together? No. But with Him living in me, I can do all things! Lord I am needing You more, I know that I’ve prayed this prayer before. Lord it seems that each passing day increases my need. Whenever the calm starts to blow. Whenever my friend becomes my foe. When I feel all alone and nobody else knows, I go back on my knees. Back on my knees where I can talk to my Father. He hears the sigh, whisper, or cry from someone like me. Any place I can find becomes an old tear stained alter. Making my faith known, in touch with the throne, back on my knees. Lord I am weary in this race and I’m well aware that there is no second place. To win or to lose, in my own hands, is my destiny. So Lord here I am once again, to pray til I catch my second wind. I’ve found in this race that I keep better pace if I run on my knees. This is the words to an old song by the McFalls. I have always loved the words to it and it is the type of song that can be used now as it was then. It is timeless. As this world is drawing to an end, (I believe that we are not far from Christ’s return), I have found that it gets harder and harder to press forward in this race. My desire is for God to find me “so doing” when He returns to get His children. I never want to be in His way or out of His will. In these last days, it is so important to keep going and not give up. If you fail, get back up, don’t stay down. We all have sinned and come short of the glory of God. It is by His grace that we are forgiven. My strength is non-existent, but God’s strength makes me strong. There are so many times that I get so weary that I just want to quit and give up. I have to hide myself in the shadow of His wings and get rid of “self weakness” so that He can do the pushing me on. If you find yourself weary, let God “re-boot” you. Get re-energized and press forward! It’s gonna be worth it all!